IGT started developing slot machines for land based casinos all over the world since the early 1980’s. They were so successful that the largest slot jackpot in the history was won on an IGT machine. Grand Monarch from IGT is the online version of one of their most popular slots machines that are played in the brick and mortar casinos around the globe. 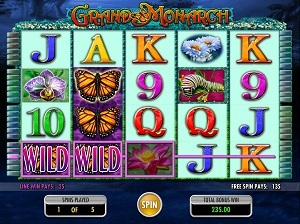 Grand Monarch includes the stacked wilds feature and a very rewarding free spin game. In addition to that, you will be blown away about how beautiful and detailed this slot machine is. Grand Monarch has 50 pay lines for you to bet on over the 5 reels. If flowers, lady bugs, butterflies and calming music that seems to be taken from the Garden of Eden is you thing, Grand Monarch will surely satisfied your gaming needs. IGT has successfully brought one of their most popular slot machines from the land based casinos to the world of online gaming. Grand Monarch is one of the best looking slot machines in the industry. The background of the game window gives an atmosphere as one would imagine the Garden of Eden. The Grand Monarch is a vision of colours and the detailed design of the symbols adds to a great impression. If you add the calming music that IGT has put in this slot machine to the graphic qualities, you can easily conclude that this slot machine is 100% in consistency with its theme. The lower paying symbols on the reels of Grand Monarch are the card deck symbols, 9 to Ace. You also have a number of symbols that are different flowers. These will pay up to 500 casino credits if 5 of them appear on an active pay line. The wild is the butterfly. The wild will substitute for all other symbols accept for the bonus symbol. If you manage to hit 5 wild symbols on a winning payline you will get paid 1,000 casino credits. The bonus symbol is the colourful caterpillar. If you hit 3 bonus symbols on the center reels you will get paid x2 and trigger the free spin feature. Grand Monarch offer a simple but very entertaining and rewarding bonus feature. If 3 bonus symbols (caterpillar) appears on the center reels, 2nd, 3rd and 4th reel, you will trigger the free spin bonus. Initially, you will be awarded 5 free spins. The free spin bonus features includes a much richer opportunity to win big as it includes more stacked wilds. You can re-trigger the free spin bonus while you play it. Additional free spins will then be added. The free spin bonus can be re-triggered multiple times up to a maximum of 255 free spins per bonus. Grand Monarch from IGT has 50 pay lines over 5 reels for you to bet on. The minimum bet per line is 1 casino credit and the max bet is 5. You can easily configure your bet preference by using the + and – buttons in the lower part of the game window. While you are playing this calming and rewarding slot machine you can choose to use the auto play function. All you have to do is to click on the Auto Spin button in the lower right corner of the game window. Once you have done that, you just choose the number of spins that you wish to play on auto. « More slotmachines guides Article last updated: Wednesday, August 15, 2012.